Home » Our Doctors » Matthew S.Thompson O.D. 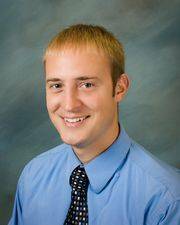 Dr.Matthew Thompson joined our practice in 2009 after working for Truitt and Truitt while he was an optometry student. Dr.Matt completed his undergraduate studies at Shawnee State University and received his Doctor of Optometry degree in 2009 from The Ohio State University college of Optometry. Dr.Matt and his wife Jessica have two wonderful little boys. He is of course an avid Buckeye fan and enjoys sports,reading and photography outside of the office.